Today, we visited the National Railroad Museum, where we rode on a refurbished 1940s train, taking us to watch a re-enacted WWII battle. 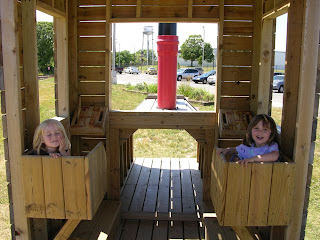 The girls were a bit scared by the gunfire, and didn't really understand what was going on, but they sure had fun playing in the train play structure and sand box. Mommy had fun walking through an old passenger train, end to end.